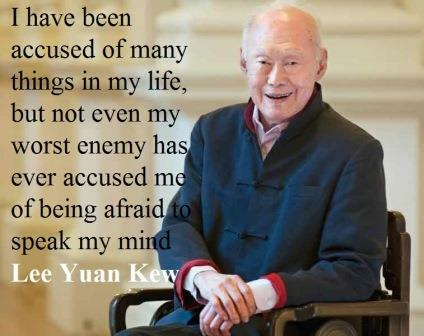 During the Japanese invasion of Singapore, Lee experienced a hard life. Then, Lee learnt Japanese and first served as a SAS (Singapore Administration Service) officer in the Sentosa Islands. When the war was about to end, while listening to the Allied radio stations, and seeing that the Japanese were losing the war which could bring about a worse war in Singapore because of the Japanese’ last gasp of fighting, he quickly planned on how to flee to the Cameron Highlands with his family. A liftboy at the office later informed him that his file had been taken; this made him realize he was being trailed by the Japanese security and he abandoned the plans. Using the war survival instincts, Lee set up a small private enterprise that manufactured stationery glue known as ‘Stikfas’ in order to keep body and soul. Lee had a very narrow escape from death when the Japanese rounded up some Chinese for questioning. At this point, Lee was told to join the Chinese men. When he felt uncomfortable in himself believing there is a problem, he requested for an opportunity to get his clothes first which they agreed, he left and didn’t return. He later discovered that the Chinese men that were separated were actually taken to the beach and shot. This was part of the Sook Ching massacre. The occupation of Singapore by the Japanese was one that would linger for a longtime in the memory of Lee. He recounted in one of his experiences how he was slapped and pressured to kneel for not bowing to a Japanese soldier. Lee, along with some young Singaporeans like him became determined and resolvedd that neither the British nor the Japanese would govern them, rather, they would govern themselves. The invasion taught him a lot of lessons that he knew would later help, most especially, using capital punishment to discourage crime. Lee felt the British could not defend them against the Japanese and after finishing his program in England, he returned home with the aim of fighting for independence. He had to expunge his English name, Harry as given by his grandfather to show his bitterness at the acts of the English men. During the national elections of 30 may 1959, the party set up by Lee, PAP, won 43 out of 51 seats in the legislative assembly. This made Singapore have a self-government and they had autonomy in all the state matters except foreign affairs and defence. On 3 June 1959, Lee became the first Prime Minister of Singapore after taking over from the Chief Minister, Lim Yew Hock. The Malayan Prime Minister, Tunku Abdul Rahman proposed that Malaya, Sabah, Singapore and Sarawak should form a federation in 1961; this made Lee to campaign against British rule after the merger. He depended on the result of the referendum of 1962, where 70% of the votes supported the end of the British rule and the remaining 30% were not given a choice, rather, No Option. Singapore joined the new Federation of Malaysia on 16 September 1963 though the union wouldn’t last after the Malays and the Chinese attacked themselves causing the death of about 23 in 1964, even when the cause of the riot was still unknown. When the crisis would not end soon, the prime Minister of Malay, Tunku Abdul Rahman, decided to expunge Singapore from Malaysia for not showing loyalty to his government. This severed all ties with Singapore. Lee rejected this decision and pushed for a compromise, however, it met resistance and as advised by Goh Keng Swee, the secession became inevitable and on August 7 1965, the secession was finalized and signed off. However, Singapore pushed for continuous interrelations in terms of trade and mutual defence. The failure of the merger was a major setback to Singapore and Lee who knew that it was very important for the survival of Singapore. During a televised conference on the same day, Lee tried to hold back tears and stopped his broadcast for a while in order to compose himself before he regretfully announced the separation and the full independence of Singapore to a teeming population waiting for good news. ‘Every moment we look back when we agreed and signed the bond that separated Singapore from Malaysia, it would remain a moment of anguish and sorrow. To me, it remains a moment of sorrow and anguish, because, for all of my life, I mean my adult life, I have so much believed in the merger of Malaysia and the unity of the both of us. We are actually connected by economics, geography and kinship ties’ – Lee Yuan Kew. Same day, after the broadcast on 9 August 1965, the Malaysian parliament wasting no time passed the resolution to severe ties of Malaysia with Singapore, thereafter, the Republic of Singapore was created. The major problem facing Singapore and makes them scared of standing alone is the lack of natural resources. Also, their water supply was primarily from Malaysia and they also had a low defensive capability. These were the fears of Lee for the new government of Singapore making them to really fight the failure of the merger (Life may make us pass through the worst moment, however, it is for our own good. If we remain in the comfort zone, we won’t move forward. If we continue to be fed like babies, then we would make no progress in life. That thing we always fear, restructuring, break up, though might not be easy at first, but would eventually pay up and would make us realize how much we can actually do for ourselves outside the help of outsiders). Even at the failure of the merger, Lee refused to convey the parliament on the issue. He asked nobody to do anything on his behalf, he just disappeared to the Singapore Islands for six weeks and he was through that time unreachable by phone. Lee first reached out to international communities on recognizing Singapore as an independent nation. This made Singapore to join the United Nations on 21 September 1965, and on 8 August 1967 established the Association of Southeast Asian Nations (ASEAN) with another four South-East Asian countries. Lee visited Indonesia officially 25 May 173 and relationship between Indonesia and Singapore improved significantly.